How the New Tax Plan Affects the High-Income Physician | Passive Income M.D. The recently passed Tax Cuts and Jobs Act is controversial to say the least. However you feel about it though, the fact is it’s here to stay, affecting everyone by 2018. We’ve already heard from Physician on Fire on how the new bill will affect him (spoiler: his taxes are going down) and a great summary of the new bill from the White Coat Investor. However, in looking at our own situation as a two physician couple (purely from the medical income standpoint), at first glance it seems as though our taxes would actually go up. In addition, if it’s going up for us, it surely must be increasing for some other physicians. To answer this, I decided to take a closer look. I’ve analyzed our situation ad nauseam, and I realized that when I factor in our other businesses and passive income sources, it gets extremely complicated very quickly. Since TurboTax isn’t going to cut it, I will definitely be relying heavily on a professional to do the job as I’ve always done in the past. However, I tried to come up with a basic, useful model on my own. My wife and I are both physicians in higher paying specialties. I operate under an S Corporation and she receives both a 1099 and W-2 from working at multiple places. But to keep things simple, I’m going to assume we receive everything through one S-Corp and I’ll assume a single 401k deduction ($18,500) so it makes sense for the married physician with a single income household. We’re fortunate that we have some ability to work more or less to adjust our incomes, therefore I decided to play out a couple different scenarios to see how things might turn out. Taxpayers who itemize can deduct at most $10,000 in State and Local income and property taxes. Federal child tax credit of $2000 per child starts phasing out at $400k income. Pass-through entities can now deduct 20% of taxable income under $315,000 with a scaled phase out up to $415,000. Personal exemptions have been repealed until 2025 so you’ll see them missing from the NEW calculations. Here’s what I found for physicians making from $400,000 to $700,000. For the punchlines, look for the TOTAL TAX line in each section. 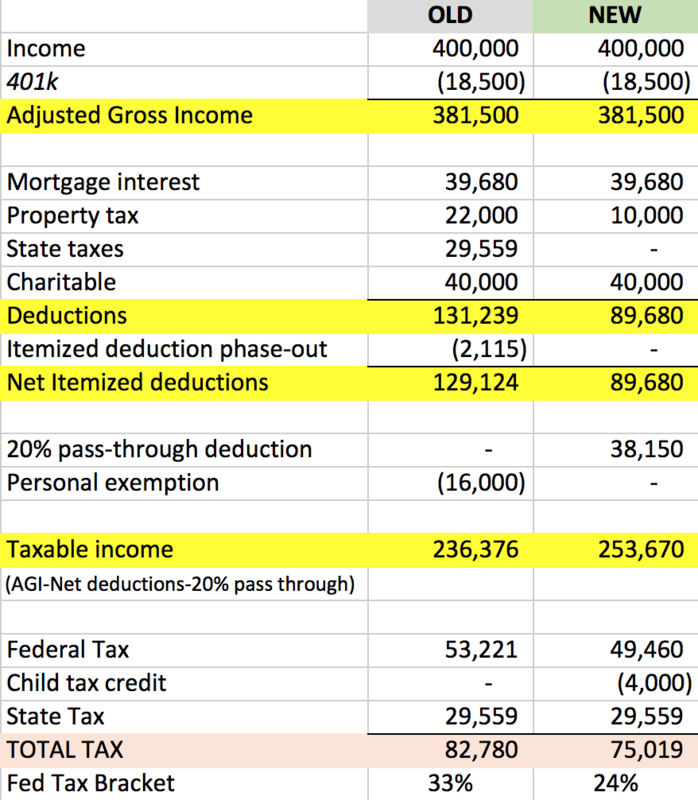 For the 400k and 500k earning physician in a high cost of living state, with those assumptions, their tax burden may actually decrease, even with state and local tax deductions & property tax capped at $10,000. This is possible because of the federal child credit, the 20% pass-through deduction on the S-corp, and the ultimate lowering of their federal tax bracket. For the 600k and 700k earning physician, looks like their taxes increased. They do not qualify for the 20% pass-through deduction or child credit. The 700k earner will see their federal tax bracket drop to 35% from 39.6% previously. However, without some of the previous deductions they could take, their overall tax burden increased. Thought I should at least mention a quick thought on the high-income W-2 employee. They will not be eligible to receive a 20% pass-through deduction in any category. Some other professions have talked about changing their designation by getting rehired as a pass-through corporation instead of as a W-2. Unfortunately for physicians, it’s likely not a possibility to do this. Ultimately, it is what it is. As always, people will adjust. With the caps on certain deductions and credits, knowing and predicting where you’ll land is important. For example, you may not want to take those extra calls knowing that it’ll make you ineligible for the child tax credit or less of a pass-through deduction. For some of your other businesses, you may want to change it from a pass-through entity to a C corp so it doesn’t affect your personal return. Sounds like the IRS is still figuring out how to interpret and implement the new tax code so look for a good number of updates over the next few months. At the very least, your accountant should have a good handle on this and be up to speed on it all. Obviously, everyone’s scenario is different. I am not a tax professional so please do not perceive anything in this post as tax advice. I recommend that you consult with an extremely knowledgeable tax professional for your particular situation. How do you expect the tax law to work out for you? Will it change how you work or practice at all? Previous articleIs a Mortgage a Great Way to Force Savings? I personally think the AMT can be sorted out (in a simplified version) to give you your most likely conservative (I.e. highest possible AMT) payment. I’ve posted about this on my website. 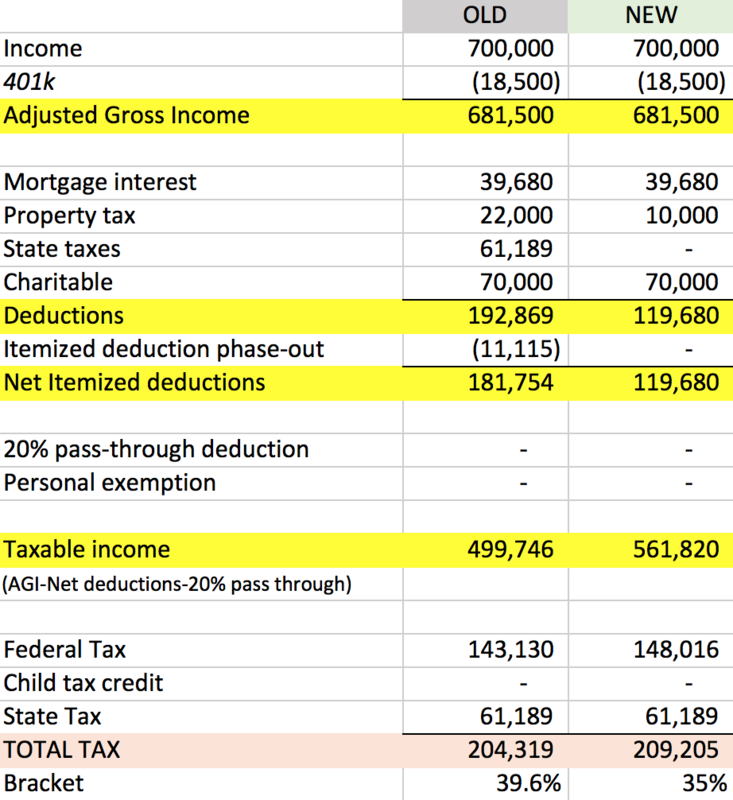 I think the AMT could still hit some (depending on the strange deductions you can or cannot take), but agree that overall most physician W-2 income and S Corp income should decrease. Apologize for my ignorance, but I don’t really understand pass through entity. Is being a self employed Hospitalist receiving 1099 could qualify as a pass through entity? With a 1099 you are an independent contractor and you are taxed the same way that you normally would be (taxes “pass through” to you the tax payer). You are considered self-employed and have to pay employer/employee social security/CMS tax. However, you can incorporate and become an LLC or S-Corp (or LLC that files as an S-Corp) to take advantage of the new tax law. However, it isn’t exactly clear if this applies to physicians or not given that the tax law has taken aim at certain service professions (such as lawyers) and disallowed them from taking advantage of this. In my mind, this is to be determined. Independent contractors/sole proprietors are eligible for the pass-through deduction. You do not need to set up an entity. Doesn’t the pass through deduction not apply to service businesses/physician practices? It does apply but starts to phase out at incomes > $315,000, with a hard cap at $415,000 for married taxpayers filing jointly. Important to note the phaseout for “service businesses” is for AGI specifically. There may be some physician families that would get some benefit from this new exemption. 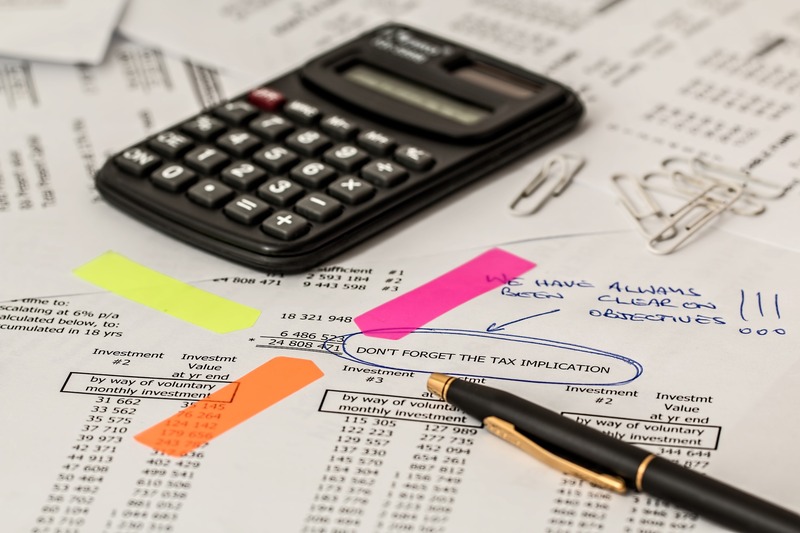 But for readers of this blog, which includes many of us with a side hustle, so long as that business income is not for a “service business”, that income can qualify for the pass thru deduction. Yet another reason to generate income through a business and not by being an employee! 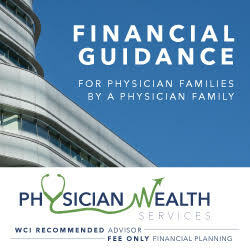 what about a calculation for W2 earner, which most physicians are on? Sure I’ll work on that. It’s actually a much easier calculation bc the 20% deduction isn’t in play. The new tax code will work out very well for me, even though I’m a W-2 employee. For the first time ever, I’ll receive a child tax credit of $2,000 for each of two children. I used to be mostly phased out of the personal exemptions, anyway, so those going away doesn’t matter. I paid the AMT, anyway, where property tax and state income tax was not deductible. Also, as a part timer, I expect to earn under $315,000, which puts me in the 24% bracket at an income that used to put us in the 33% marginal bracket as a married couple. Yeah there’s definitely a sweet spot and you seem to be right in the middle of it! This is good stuff. Obviously we all have to do our own homework. 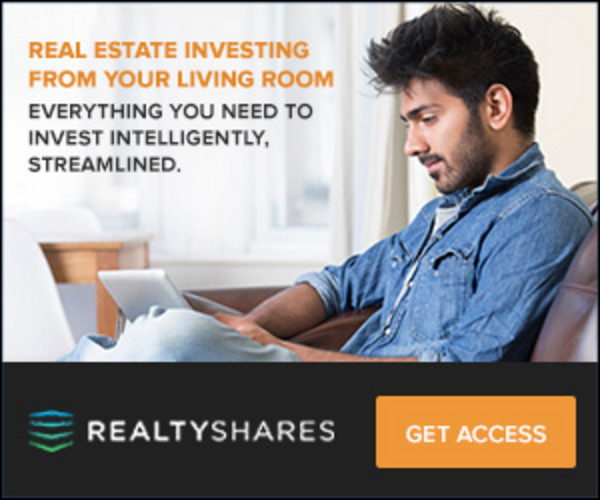 Does anyone have clarity on the issue of investment income from real estate holdings that are housed in an LLC for a physician who makes above the $415,000 level? Is there still the ability to deduct the 20% of this income for the investment return earned outside of their professional earnings? read this… it makes me think that you’d qualify for the 20% deduction on that income. My wife and I are both Physicians and I am in the process of setting up a PLLC. 1. Is it true that we should both set up different LLC’s to separate our liabilities in case of Malpractice? 2. If we create separate LLC but we are each a member on each others LLC, does that protect from liability? Thank you for this post—it’s golden! I’ve had a hard time figuring out how I’ll be affected by this in a dual physician household (husband has an S-Corp and I’m W-2) living in CA making close to 7 figures. Short answer is taxes will be going up. Definitely not trying to illicit sympathy but it is disturbing to me that high earning doctors making over $415k (and lawyers, financial professionals) are arbitrarily excluded from the pass through deduction in a tax bill that otherwise seems to help the wealthy. Oh well, as you stated it is what it is. Next order of business will be to crunch the numbers on converting to a C-Corp.
For some that conversion to a C-Corp will make sense. I’ll be talking to my accountant about that for sure. A friend recently joked, let the lawyers figure it out and then do what they do. Thanks for an excellent article. My question is whether or not doctors who are currently in S-corps should perhaps convert to a C-corp to take advantage of the 21% corporate tax rate. I understand that C-corps need to pay additional taxes on end of year dividends; however, that is something that the vast majority of doctors don’t need to do since they “zero out” the profits at the end of the year by issuing dividends to themselves. Almost all of the doctors that I deal with follow this practice and have never paid taxes on dividends or been audited for this practice. Therefore, if you don’t pay taxes on dividends and if the tax rate on the C-corp is going down to 21%, why should an S-corp not convert to C-corp? Or am I missing something here? As far as I know, the C-corp would be taxed at the 21% rate and then dividends actually are taxed at the personal level. Not sure how those doctors would get around being taxed on those dividends, tell me if I’m wrong. It’s just a numbers game, and when factoring in conversion fees, tax preparation issues, and the actual taxes themselves, it may not be worth it. I think it’s definitely something you’d have to work out with your CPA on paper before making that decision. Would you consider sharing a link to your Excel sheets? Trying to get some advice planning ahead for 2019. Will discuss with my accountant but want to get a feel first. Will be making $300k from w2 and $200k from 1099. Married, wife is still in training and currently makes $50k. 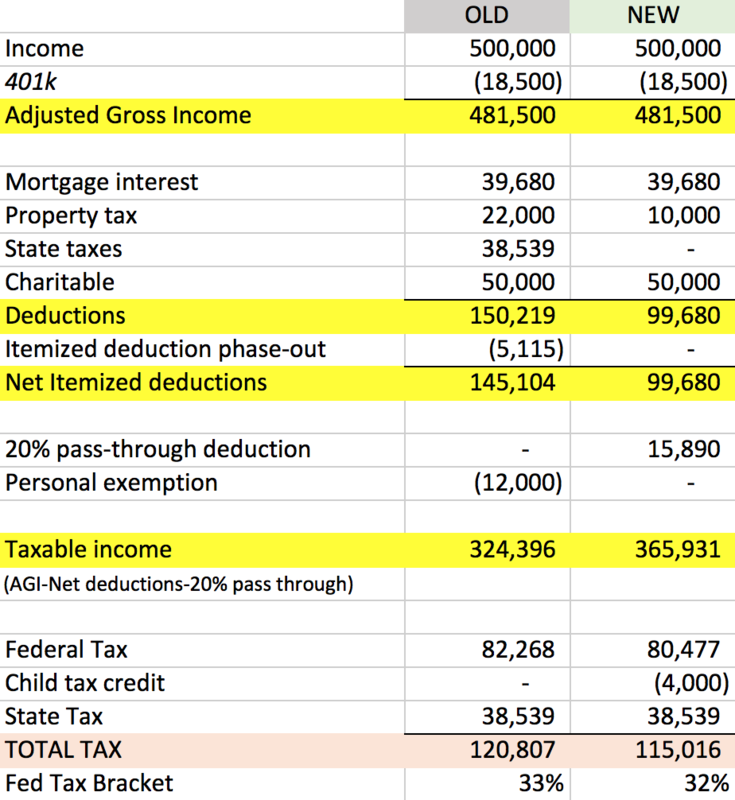 Will I qualify for the full 20% pass through on the $200k 1099 income? Also, do i have to incorporate to get a pass through? How does it work if I have a mix of W-2 and 1099 income? I work several physician jobs. Also, we file jointly (married). Are the income limits based on our total income? Good question, can get complex with multiple income sources and types. Income limits change based on filing jointly. For the rest of these I’d refer to you to a knowledgeable CPA. Honestly they’re still figuring out how all this will work. Question: my physician colleague makes $150k W2 salary, and made $2000 lecturing and received a 1099 for the $2000. They told me they plan to deduct all the itemized deductions pre 2017 (eg home office, license, internet, cell phone) from their income, all based on this idea that they have a 1099. This does not make sense to me- should they only be able to deduct against that 1099 income (max $2000)?